What’s the next biggest bathroom design trend for 2017? Have you ever flicked through a Home Magazine from the 1970’s and looked at what was “trending” back then? We may have love the trends back in the 70’s but look how quickly trends can change! It’s no longer about the fleeting trends from season to season. This year’s 2017 bathroom trends is all about longevity, timeless beauty that stands the test of time. Today people are embracing the “less is more” philosophy when it comes it bathroom design. Look for simplicity that embraces quality and classic endurance. A minimalist bathroom is an interiors perfection, keeping the design simple and timeless while optimizing the space. 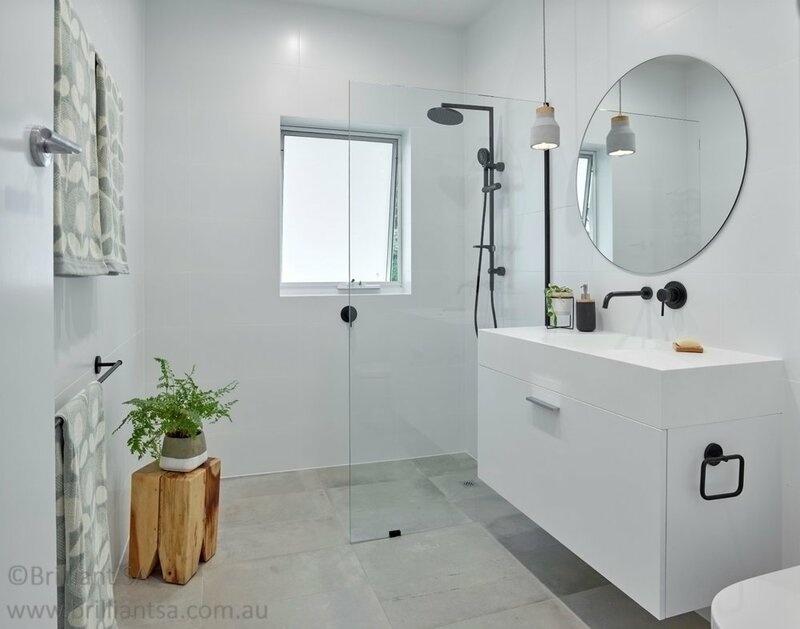 A sleek streamlined bathroom lends itself to clean lines, neutral colour schemes and shapes that enhance your home's overall aesthetic appeal. Minimalism is a style that makes a space feel serene and peaceful. Keeping a design reasonably simple with minimal bathroom accessories on display. Bathroom designs are becoming more inspired by the intrinsic beauty of nature for its earthy tones and textures that create a peaceful tranquil ambience. Natural organic finishes are great for keeping the bathroom classic and understated. People are becoming more adorned to natural materials of natural stone or imitate looks of stone look, timber look, marble look and concrete look tiles that introduce a flawless finishing touch. The trend for inviting nature into the bathrooms is set to continue to be a popular choice for its timeless and aesthetic appeal. Concrete tiles continue to be a popular choice in bathrooms for its timeless appeal. Today we are seeing accessories be the staple piece to the bathroom. Chrome tapware was always the go-to finish for bathrooms. But now we are seeing black tapware outshining chrome for its sleek and elegant touch. Tapware was seen as a necessity, but is now about adding instant style. We have seen waves of metallic golds, rose gold tapware, but black tapware is here to stay!